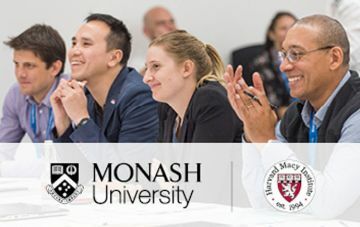 The Monash Institute for Health and Clinical Education was established to provide innovative and contemporary continuing education for professionals in healthcare delivery, education, and administration. Our programs extend locally and internationally, throughout the vast and well established Monash network. The Monash Institute for Health and Clinical Education is part of the Faculty of Medicine, Nursing and Health Sciences. Browse our short courses Find out more. Subscribe to our mailing list Find out more. Monash University in collaboration with the Harvard Macy Institute will deliver a five-day short course, right on your doorstep in Melbourne. A 3 day course designed for scholars to learn about the various simulation modalities such as task trainers, manikins, screen-based simulators and humans (simulated participants). For each modality, scholars will learn to make decisions about selection of simulators for specific learning activities. Education in the health professions involves extensive assessment of students or trainees. This 3 day course is designed to help you develop or extend your knowledge about assessment and to provide you with frameworks to refine the implementation of assessment in your professional context. Authorised by: Chief Marketing Officer, Strategic Marketing and Communications. Maintained by: Monash Institute for Health and Clinical Education Webmaster Team. Last updated: Oct 2018.